In Part 1 of Fluid Hydraulics we discussed specific gravity and how it varies depending on the density of the fluid. Today we are going to discuss another factor that affects the fluids you pump through your hydraulic equipment — vapor pressure. Vapor pressure, also known as the “Boiling Point,” is the pressure below which a liquid at a given temperature will become a gas. Standard atmosphere (atm) is a unit of pressure based on the average atmospheric pressure at sea level. According to the International Union of Pure and Applied Chemistry (IUPAC), the reference pressure referred to in “Standard Temperature and Pressure” (STP) was once commonly 1 atm (101.325 kPa). However, in 1982 the IUPAC recommended that for the purposes of specifying the physical properties of substances, “standard pressure” should be precisely 100 kPa (1 bar) (see chart below). The actual atmospheric pressure of a liquid depends on a number of conditions including temperature. For example, below you will notice that although the temperature is the same for each substance, their individual vapor pressures differ drastically. The actual atmospheric pressure of a liquid depends on a number of conditions including temperature. 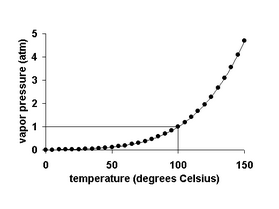 It is important to note that vapor pressure increases non-linearly as the following graph shows for water. Note: Substances that have high vapor pressure at normal temperatures are often referred to as volatile. Remember, when the temperature of a liquid increases, its vapor pressure also increases. Conversely, vapor pressure decreases as the temperature decreases. Substances that have high vapor pressure at normal temperatures are often referred to as volatile. Essentially, volatility is the tendency of a substance to vaporize. In other words, at a given temperature, a substance with a higher vapor pressure will evaporate quicker than a substance with a lower vapor pressure. Some examples of volatile substances include: alcohol, petrol, acetone, chloroform and perfume! Due of their low boiling points, volatile liquids evaporate very easily at room temperature. Thus, why perfumes use volatile liquids — so that their scent can disperse more quickly into the air.